Preheat oven to 200°C (400°F). Slice garlic clove in half and rub flatbreads with cut side. Brush breads with olive oil. Crumble ricotta over bases. Peel, de-seed and thinly slice papaw, then layer over ricotta. Cut prosciutto slices into large ribbons and arrange over other ingredients. 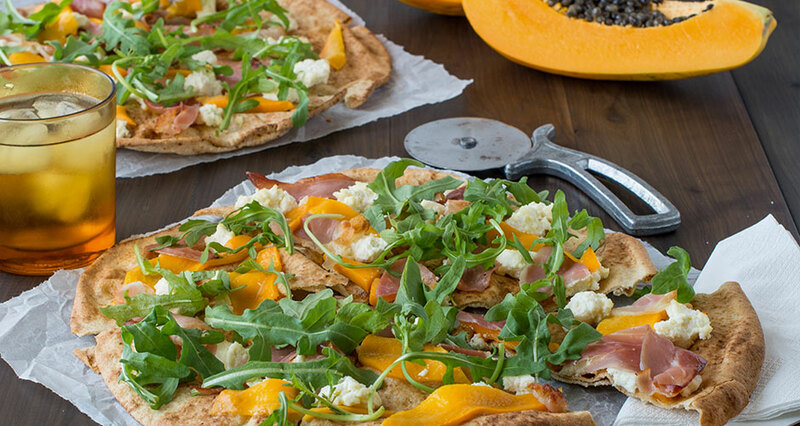 Bake on a pan or pizza stone for six minutes, until prosciutto is sizzling and bases are just crisp. Top with rocket and drizzle with a bit of extra oil, slice into wedges and serve warm. Tip: For an extra crispy base, bake pizza directly on oven rack.